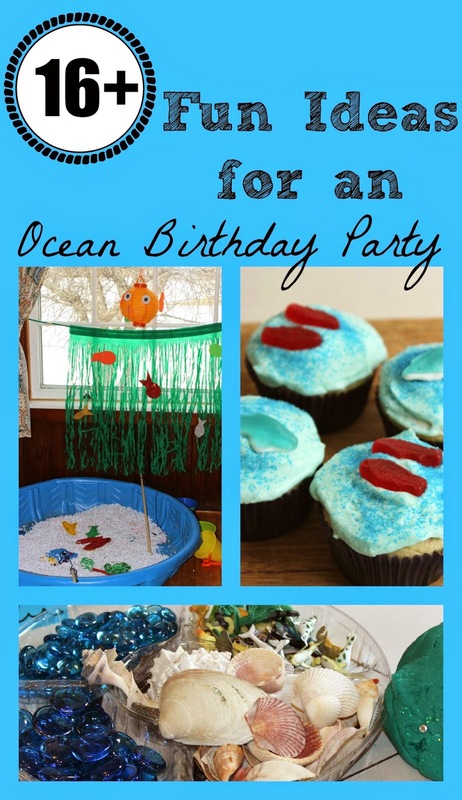 As we've mentioned before, we love sharing our birthday party ideas here at Kitchen Floor Crafts. This Ocean Birthday Party for Big Brother's 5th birthday was especially memorable as it was the first time he really participated in preparing for the event. But I should add these are real parties planned by me, a real mom. Sometimes I love the party themes and ideas I find on Pinterest, I'm in awe of how coordinated they are. But then I realize many of them are put together by professionals. These parties are our real parties, captured in the moment as I also try and run the party. They are still hugely successful, and we've loved every one! 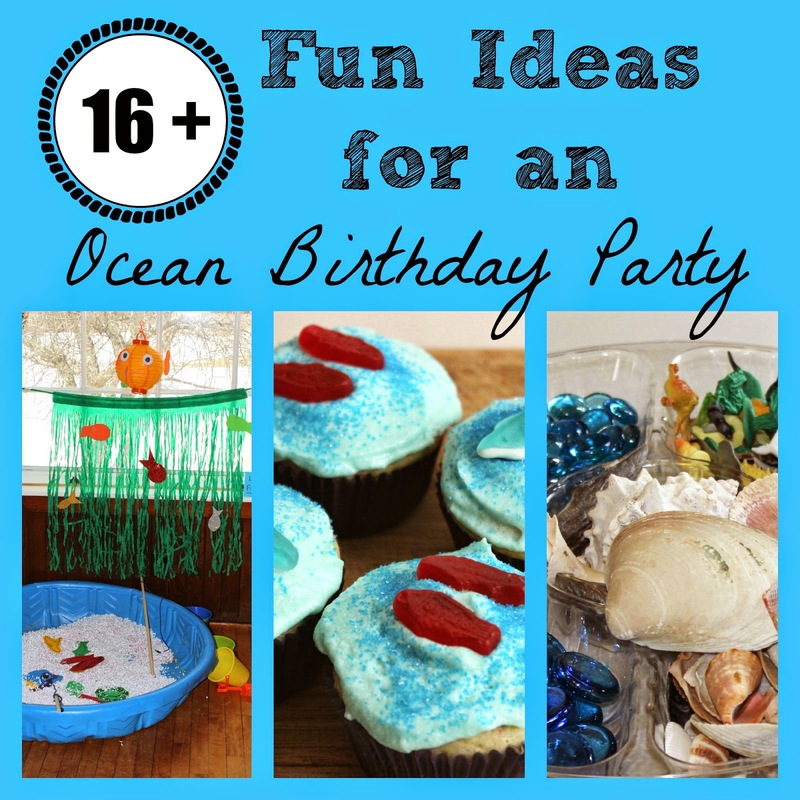 There are definitely lots of ideas out there for an Ocean Birthday theme, and it was fun to look around before we got started. 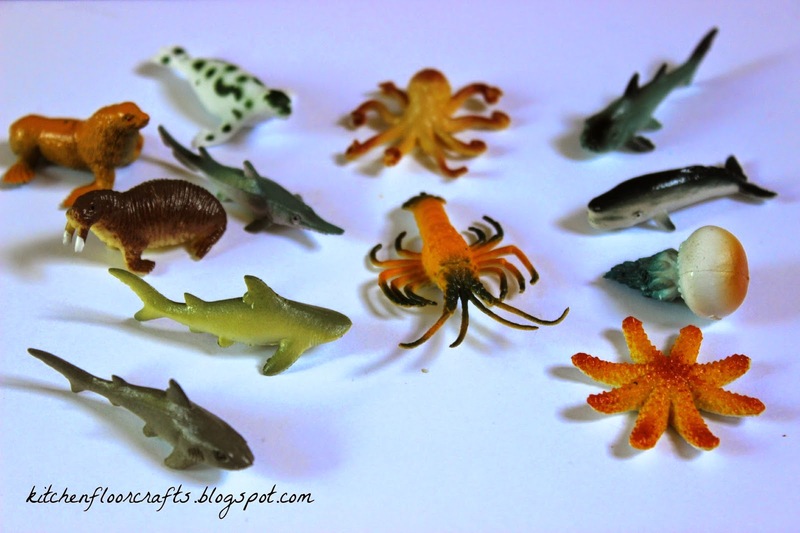 We also love ocean play ideas here at Kitchen Floor Crafts, so we were able to use some of our old ideas too. We were expecting quite a crowd, as we had decided to invite all of Big Brother's preschool and a handful of other local friends. I wanted to make sure there were lots of activities and easy to grab snacks. 2. Our favorite part of the food was, of course, the cupcakes! We used one of our favorite cupcake recipes from Sally's Baking Addiction for Easy Homemade Funfetti Cupcakes and dyed her Vanilla Buttercream frosting light blue. 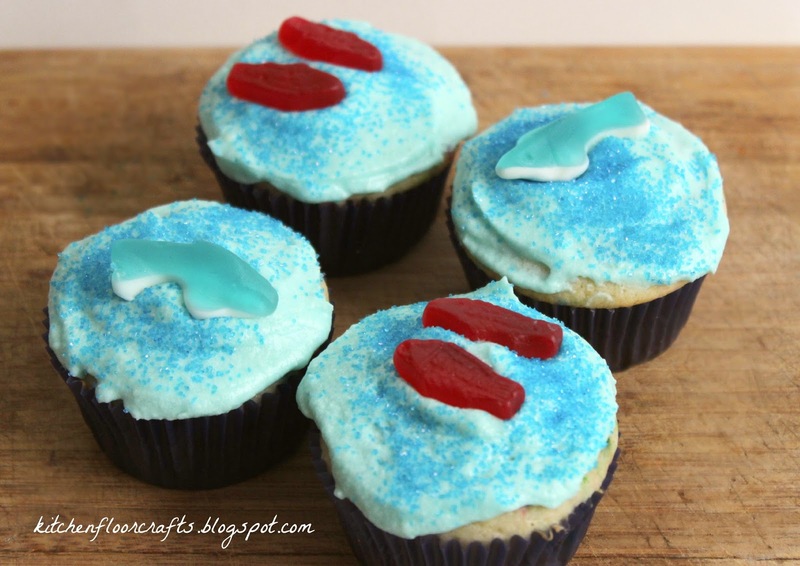 We added gummy fish and gummy sharks to the tops with a sprinkle of blue sugar. This was one part Big Brother definitely loved helping with. 3. One of my favorite finds was the hula skirts currently in the Luau section of The Dollar Tree. We taped them up as seaweed along the window edges. Big Brother cut fish out of craft foam and we paper clipped them to the skirts. 4. 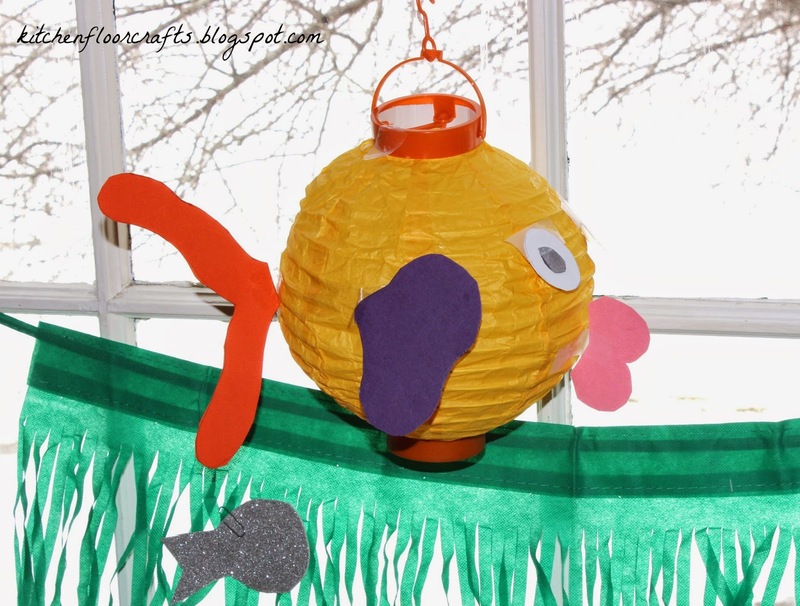 Big Brother had spotted these fun fish lanterns on the internet, and really wanted to try making them. I was excited to find lanterns also at the dollar store. He and my mother-in-law put several together using construction paper and tape. 5. We used paper table cloths, napkins, plates, and silverware in different shades of blue and green from Walmart's party supply section. 6. I also added in a handful of helium balloons in blues and greens. 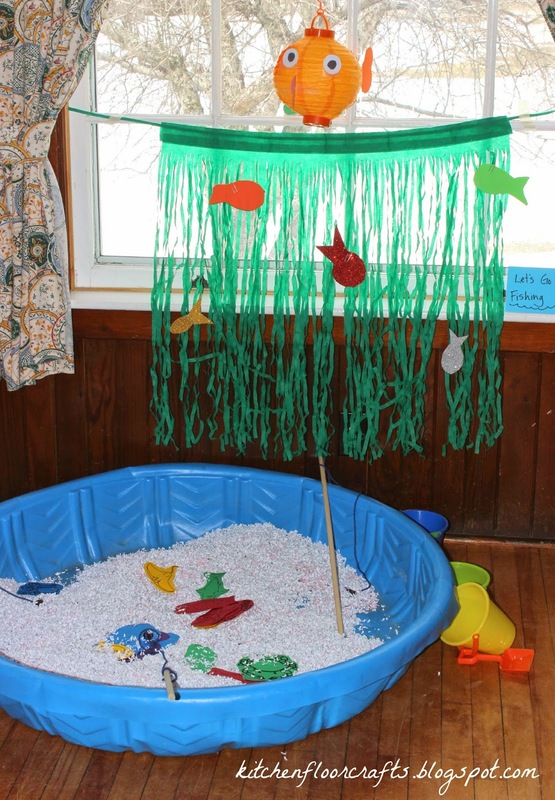 We usually rent a local community hall for our party, but that means we need to bring all the kid activities in. Luckily, we had several ideas! 7. 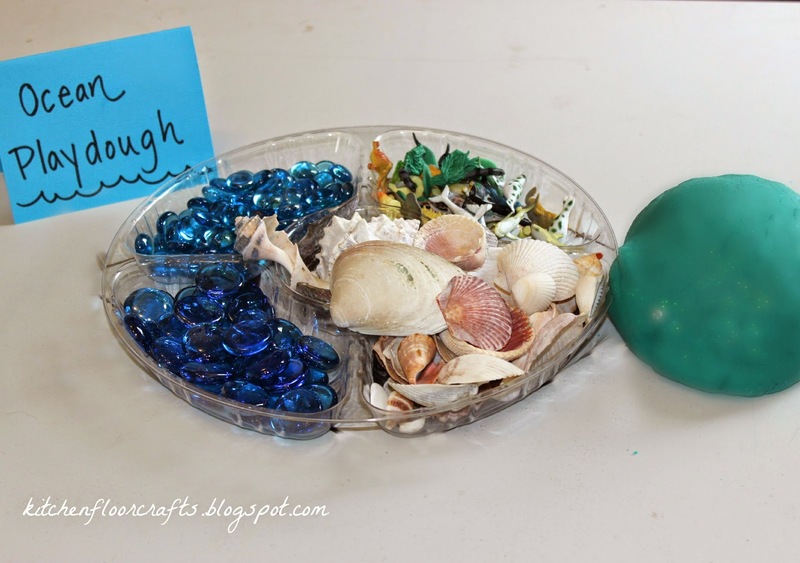 Seashell and sea creature playdough: this playdough activity was a huge hit this summer, so we recreated it for the party. 8. 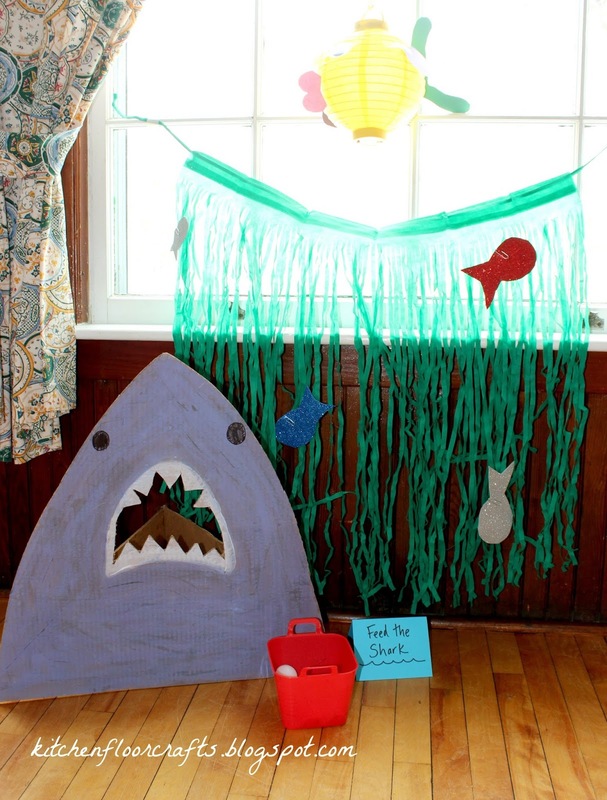 Big Brother and I loved this Feed the Shark idea from Toddler Approved, and decided to create something similar with a party game theme. I cut the shark out and Big Brother painted it. We decided to have it be a ping pong ball toss and I drew small fish onto white ping pong balls. Kids fished using magnets tied to dowel rods and they collected the fish in buckets. They created some great pretend play ideas as they fished. 11. 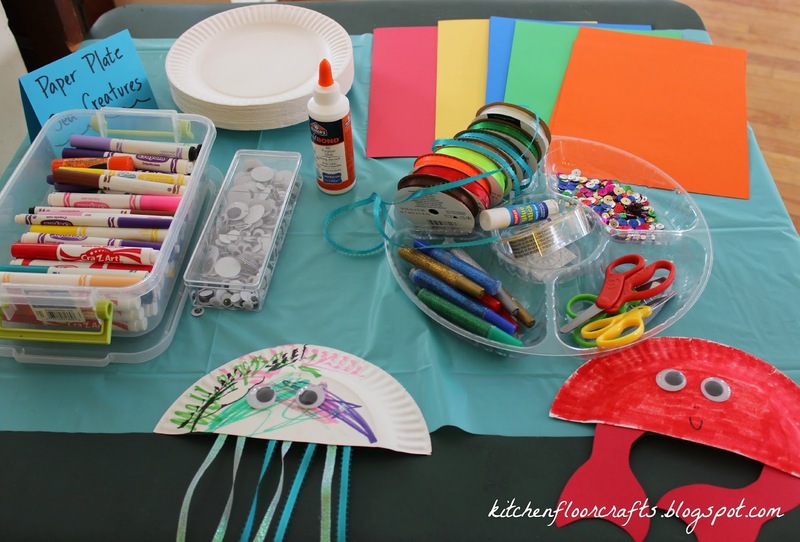 A second arts and crafts table included creating paper plate sea creatures. I filled the table with paper plates, markers, glue, ribbon, googley eyes, sequins, colored card stock, and glitter glue. We put out a few different ideas, some of our inspiration came from here and here. Mostly we let the kids go to town. My favorite creation was one guest created a manta ray! 13. When the kids needed to move a little we played "Fish, Fish, Shark." We played just like "Duck, Duck, Goose" but just with different words! It was a HUGE hit. 14. We also had a quick relay race with plastic fish and buckets between two teams. 15. The ultimate activity was Big Brother's idea, a piñata! He's been to several parties with lately with piñatas, and couldn't wait to have one at his own party. My husband found this shark one at Party City. 15. 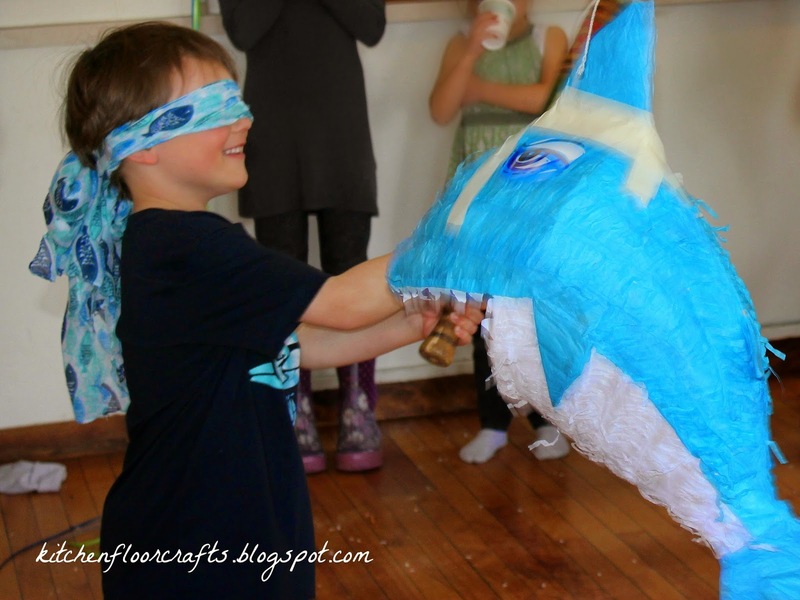 We filled the piñata with several different favors: fish tattoos, gummy shark packs, smarties candies, lollipops, small chocolates, pencils, and erasers. Kids collected (and shared their goods) in small, blue paper bags. 16. My original favor idea had been a little simpler, so we went ahead and created these favors too. 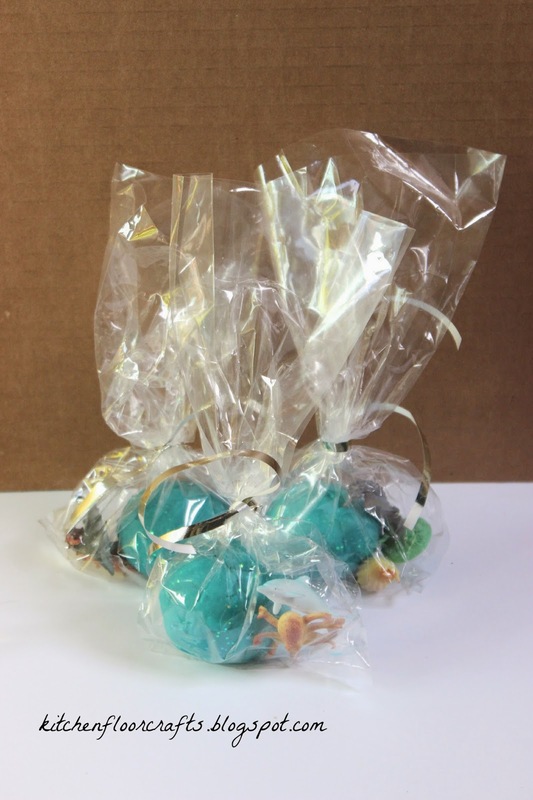 We put together small bags of ocean playdough with a couple of sea life figures in each bag. Each kiddo took one home as they left the party. My favorite thing about this party is at several points of the party the adults could look around and find all the kids actively engaged with one activity or another. It was so fun to see everyone so involved! Ohh how cool are these! 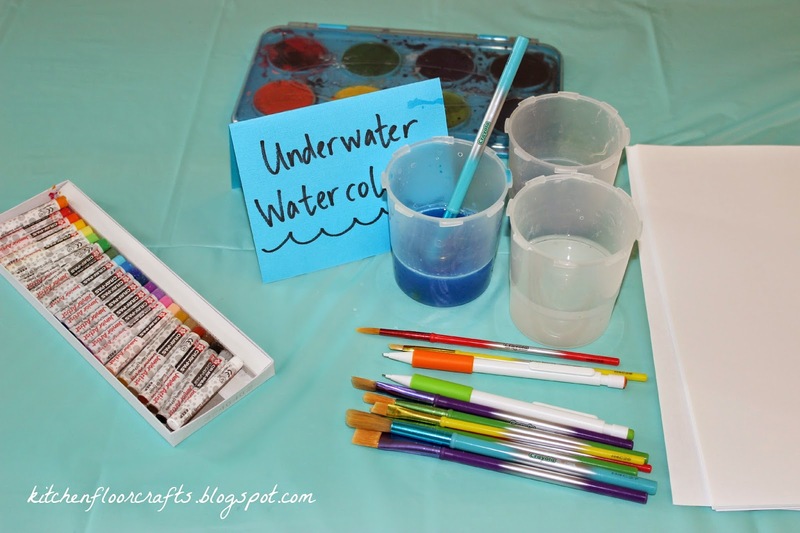 I work in early years and some of these creative activities are fab!! Love that you make everything for the party yourself, party supplies can be super expensive! !